Wearing a midnight-blue avant-garde sequin cocktail dress with a plunging v-neckline and no jewelry except for pearl stud earrings, she looked stunning. Her lips glistened into a smile when he touched his nose to hers, coming into a kiss, almost. Ash took in the trace of Dior Sauvage aftershave on his chin, and her eyes closed as she gave a little moan. Then she pulled back, took a silk apron off a hook, and joined him in preparation of the meal, as if no time had passed since their last date, way back when. She gave a little giggle, so he figured he need not be too cautious in using terms of endearment. Peppercorns danced their way with a pinging sound into the mill. Michael dialed it to the exact grind he wanted. Then he sprinkled freshly ground pepper into the bowl, and for good measure, added a dash of hot pepper sauce and a squeeze of lemon juice. Ash toasted some slivered almonds, to be stirred into the concoction just before serving on top of the poultry dish. The aroma tingled his nostrils. It was wonderfully enticing. Next, she took the chicken out of the refrigerator and stuffed its cavity with a bunch of fresh thyme, both halves of a lemon, and a head of garlic, cut crosswise. “Is that a new dress?” he asked. In place of a reply, she blushed. With impatient strokes, Ash brushed the outside of the chicken with melted butter and sprinkled it with salt and freshly ground pepper. Then she tied the legs together with kitchen string and tucked the wing tips under the body of the chicken. “And so are you,” he said. Join us for a chance to win audiobooks! A Virtual Reality Mystery Solved! Cool! 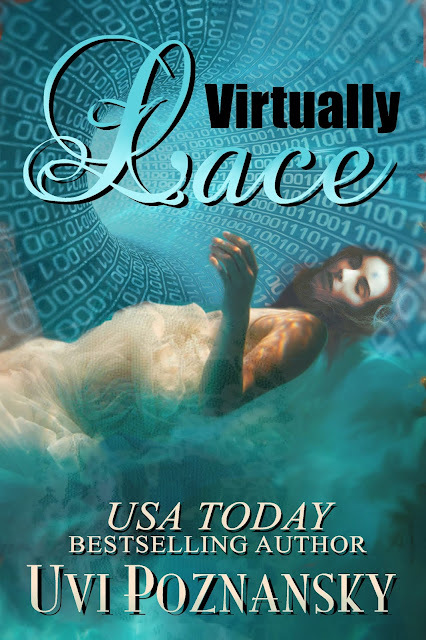 Virtually Lace: the audiobook edition is out!